This dessert is easily made at home. Just follow the simple steps in our Mocha-Creme Caramel Cups recipe and you'll see for yourself. 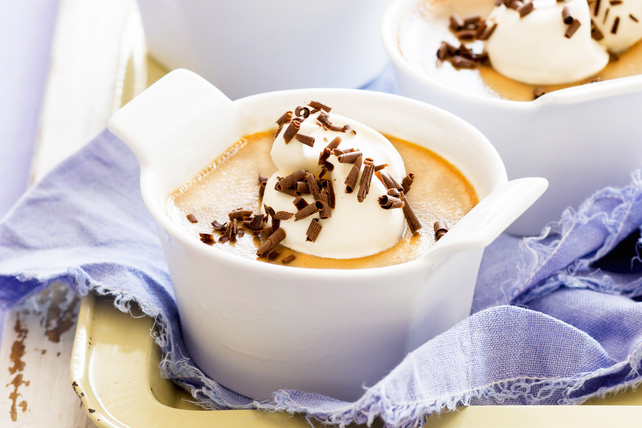 Our rich and decadent Mocha-Creme Caramel Cups recipe is a must-try! Microwave milk in microwaveable bowl on MEDIUM 1-1/2 to 2 min. or just until warmed. Place chocolate and cream cheese product in blender container. Add milk; blend on high speed until chocolate and cream cheese are completely melted and mixture is well blended. Add all remaining ingredients except Cool Whip; blend until smooth. Pour into 8 (125-mL) ramekins; place in shallow baking dish. Add enough water to baking dish to come halfway up sides of ramekins. Bake 45 to 50 min. or just until centres are set. Cool completely. Prepare using Baker's Semi-Sweet Chocolate. Serve topped with shaved Baker's Semi-Sweet Chocolate in addition to the Cool Whip.